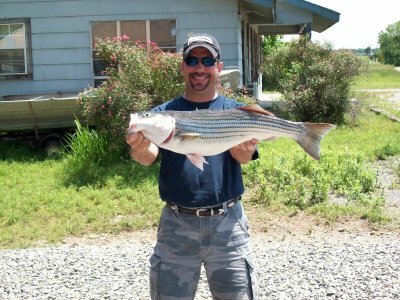 With the Memorial Day Holidays behind us and the June days heating up, the striper fishing on Lake Texoma is at it's best. Limits of stripers are being caught all over the lake. Although I have caught some fish on top-water, live bait is still my preference at this time. The water temperature of Lake Texoma is 82 degrees with an elevation of 618.79 feet above sea level. 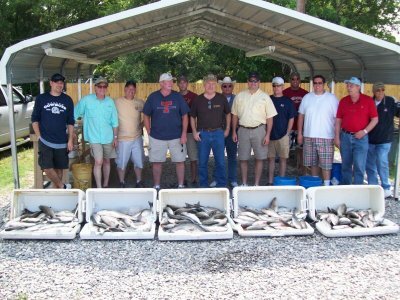 I have been fishing in the 45 to 70 feet range of water for the past couple of days with very good results. I am starting to see some larger stripers show up in the deeper water due to the warmer water temperature. With school letting out there is a lot more boat and personal water craft (jet ski) traffic on Lake Texoma so vest up, be aware of the traffic around you and have a fun safe day fishing for some good sized Lake Texoma stripers.